In 2016, Sauders Hardscapes of Blue Ball, contacted us, at Lancaster County Backyard, about building a timber frame storefront for their showroom. Sauders has been working on improving their hardscape paver outlet center over the last few years. This January 2017 mortise and tenon project is a great addition to this endeavor. It had been very needful to give their reputable showroom a facelift. Now with a brand new front, Sauders’ customers are greeted by this stunning piece of artwork and introduced to a great experience into Sauders’ store and showroom. Under normal circumstances this timber frame storefront will last a long time. Firstly the wood materials are significantly sized. Rather than the usual 6×6 posts, as on our other structures, this beast has 8×8 posts. This is about twice the load bearing capacity. Instead of a 4×10 beam it has 8×12 beams. This is more than twice the weight bearing capability. The rafters are 4×8 instead of 2×6. This keeps the roof from sagging for a long time. Secondly the materials are high quality and well chosen. Rather than using cheaper pine materials we used douglas fir. This wood is both stronger and less prone to crack and warp. It will also resist rot a long time. Besides the wood quality the straps and brackets are also high quality. They are both stainless steel and powder-coated. The rust bugs will stay far away. Thirdly the design is noteworthy. The hammer truss is designed to span long distances without sagging. Braces and cross members keep it from shifting. 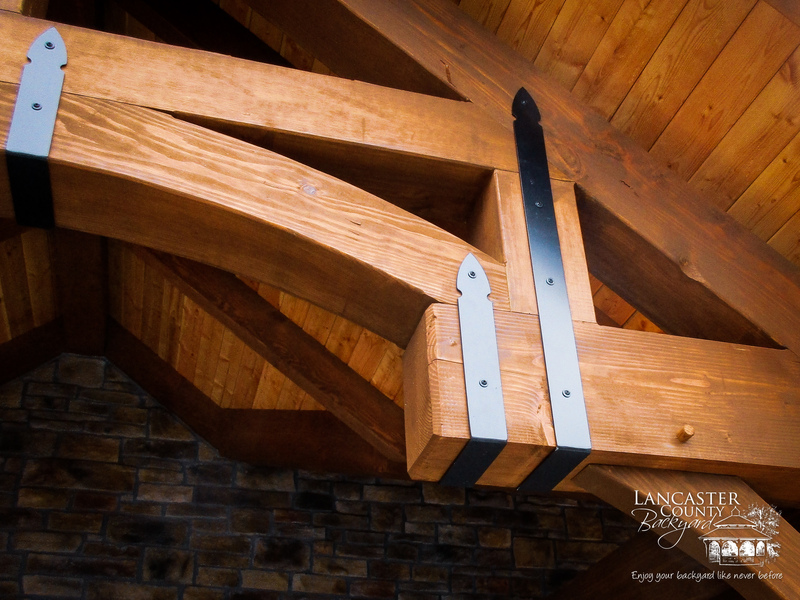 The post and beam pins keeps all the parts snuggly in place. It is designed to keep its form and strength for years. Overall this timber frame is assembled well and designed impressively. The intent is to “WOW” the visitor and encourage them to come back over the course of many years. This timber frame storefront has many unique attributes. It has special lights. It has a special design. It has a stain color made just for this job. It is a building like no other. It is an eye-catching building with many unique features. It is best called, a custom designed building. Here at Lancaster County Backyard, custom designs are what we are passionate about. It is our pleasure to change the blueprint to match the customer’s needs. What we did in this case is we drew from our designs and experience in timber frame pavilions. Then we changed and fitted the design to fit the needs of Sauders. An example of our custom structures, besides this one, is the custom gazebo at the Creation Museum in Cincinnati, Ohio. A lot about that gazebo was normal procedure. Nonetheless a significant amount of the work was customized to fit the situation. The oval ends were built just for that situation. The size was unique. It was a gazebo built for the situation.